Parvati is the daughter of the king of Parvatas, Himavan and the consort of Lord Shiva. 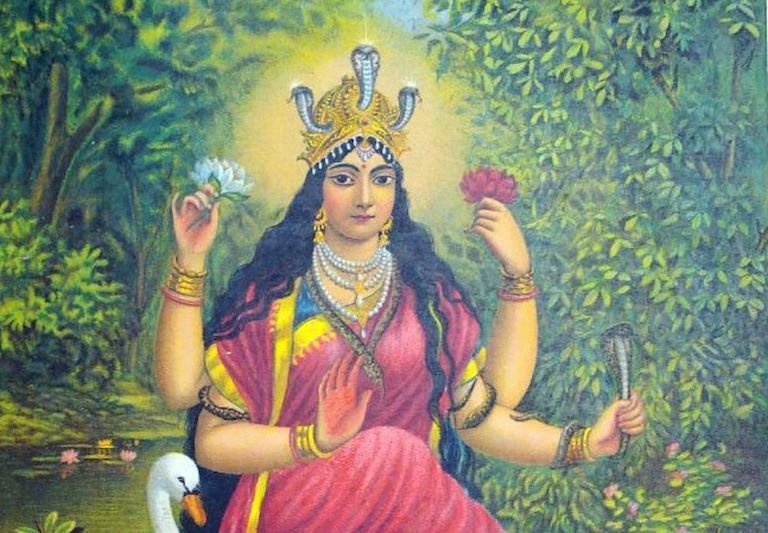 She is also called Shakti, the mother of the universe, and variously known as Loka-Mata, Brahma-Vidya, Shivajnana-Pradayini, Shivaduti, Shivaradhya, Shivamurti, and Shivankari. Her popular names include Amba, Ambika, Gauri, Durga, Kali, Rajeshwari, Sati, ​and Tripurasundari. Parvati’s tale is told in detail in the Maheshwara Kanda of the Skanda Purana. Sati, the daughter of Daksha Prajapati, the son of Brahma, was wedded to Lord Shiva. Daksha did not like his son-in-law because of his queer form, strange manners, and peculiar habits. Daksha performed a ceremonial sacrifice but did not invite his daughter and son-in-law. Sati felt insulted and went to her father and questioned him only to get an unpleasant reply. Sati got enraged and did not want any more to be called his daughter. She preferred to offer her body to the fire and be reborn as Parvati to marry Shiva. She created fire through her Yoga power and destroyed herself in that yogagni. Lord Shiva sent his messenger Virabhadra to stop the sacrifice and drove away all the Gods who assembled there. The head of Daksha was cut off at the request of Brahma, thrown into the fire, and replaced with that of a goat. Lord Shiva resorted to the Himalayas for austerities. The destructive demon Tarakasura won a boon from Lord Brahma that he should die only at the hands of the son of Shiva and Parvati. Therefore, the Gods requested Himavan to have Sati as his daughter. Himavan agreed and Sati was born as Parvati. She served Lord Shiva during his penance and worshiped him. Lord Shiva married Parvati. The celestial sage Narada proceeded to Kailash in the Himalayas and saw Shiva and Parvati with one body, half male, half female – the Ardhanarishwara. Ardhanarishwara is the androgynous form of God with Shiva (purusha) and Shakti (prakriti) conjoined in one, indicating the complementary nature of the sexes. Narada saw them playing a game of dice. Lord Shiva said he won the game. Parvati said that she was victorious. There was a quarrel. Shiva left Parvati and went to practice austerities. Parvati assumed the form of a huntress and met Shiva. Shiva fell in love with the huntress. He went with her to her father to get his consent for the marriage. Narada informed Lord Shiva that the huntress was none other than Parvati. Narada told Parvati to apologize to her Lord and they were reunited. One day, Parvati came from behind Lord Shiva and closed his eyes. The whole universe missed a heartbeat – lost life and light. In return, Shiva asked Parvati to practice austerities as a corrective measure. She proceeded to Kanchipuram for rigorous penance. Shiva created a flood and the Linga which Parvati was worshiping was about to be washed away. She embraced the Linga and it remained there as Ekambareshwara while Parvati stayed with it as Kamakshi and saved the world. Parvati had dark skin. One day, Lord Shiva playfully referred to her dark color and she was hurt by his remark. She went to the Himalayas to perform austerities. She attained a pale complexion and came to be known as Gauri, or the fair one. Gauri joined Shiva as Ardhanarishwara by the grace of Brahma. Parvati ever dwells with Shiva as his Shakti, which literally means ‘power.’ She sheds wisdom and grace on her devotees and makes them attain union with her Lord. The Shakti cult is the conception of God as the Universal Mother. Shakti is spoken of as Mother because that is the aspect of the Supreme in which she is regarded as the sustainer of the universe. Hinduism lays a lot of emphasis on the motherhood of God or Devi. The Devi-Shukta appears in the 10th mandala of the Rig-Veda. Bak, the daughter of sage Maharshi Ambrin reveals this in the Vedic hymn addressed to the Divine Mother, where she speaks of her realization of the Goddess as the Mother, who pervades the whole universe. 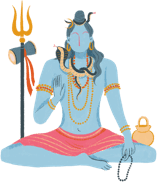 The very first verse of Kalidasa’s Raghuvamsa says that Shakti and Shiva stand to each other in the same relationship as the word and its meaning. This is also emphasized by Sri Shankaracharya in the first verse of Saundarya Lahari. Shiva and Shakti are essentially one. Just as heat and fire, Shakti and Shiva are inseparable and cannot do without each other. Shakti is like the snake in motion. Shiva is like the motionless snake. If Shiva is the calm sea, Shakti is the ocean full of waves. While Shiva is the transcendental Supreme Being, Shakti is the manifested, immanent aspect of the Supreme.